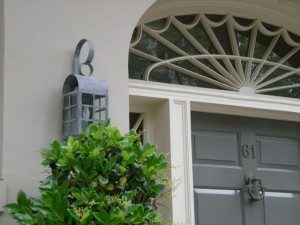 We just love beautiful doors and windows. So on a very regular basis, we’re going to post idea pictures on this blog and Facebook. Stay tuned. We’ll have the door for you. This door is very old and located in the deep South. It’s a wood six-panel door painted medium gray. The sidelites and elliptical transom contain clear glass which was most likely glazed and built on the spot. 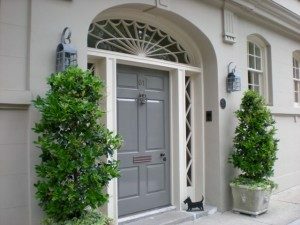 All the different decorative features make this ‘door’scape gorgeous: the light gray exterior walls; the medium gray door framed by white jambs; substantial light fixtures with patterns mimicking the door panels and the curves in the transom; and the potted greenery. Notice the size and height of the greenery (good scale) and its color just pops against the light gray wall. Perfect complement! Check out the door stop on the threshold. Is that a Scottish terrier? “Person to Person” with George Clooney and his Doors! Want to “Pretty-Up” Your Porch?